The Christ in Prophecy Journal: What Happens When You Do Not Die? i'm so sorry about the loss of your pets. God loves his animals and knows how important they are to us. This whole situation must have been an ordeal. My condolences to you. I'm glad to hear that God has been merciful. unexplainable tests and times.So much,suffering from depression so great, I prayed for God to take me. Kathryn, I'm sorry to hear about the depression you're experiencing, and that the article helped some. Know that if you are a believer in Jesus, that the Holy Spirit lives within you. No demon can enter what God now calls holy, so you will not need an exorcist. They're reminding us that the best antidote to problems, suffering and sadness is to constantly praise the Lord for all things and in all situations. Oh, how my heart grieves for you and the loss of your pets! And how my heart rejoices that you know Jesus as your Savior! May He give you peace (and two new puppies). (Commenting on the comments): The first thing everyone focuses on is the pets?! I think it was foolish to try to rescue your pets. What if you had been killed in the attempt? And to think you left your wife alone on the shore in that condition? What if your wife had stopped breathing again while you were trying to save an animal? You don't risk your life for an animal and you don't leave a human who nearly drowned unattended. Get some perspective people! Animals are not on the same level as people. I bought a place on Watauga Lake 8 years ago and go their frequently to commune with nature. 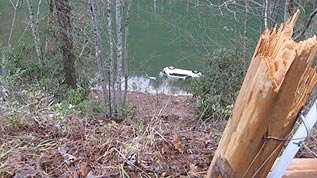 Two or three years ago I was in a boat near Lakeshore Marina when I heard a crash and saw a car plunging into the lake. 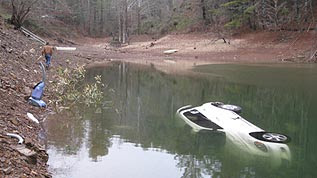 I was able to pull a fellow and his pregnant girlfriend out of the lake but couldn't get to the driver so count your lucky stars. Sounds like God still has a purpose for you both. Great story! God has more plans for you.